A conference of Israelis seeking to change al-Aqsa’s status quo takes place in parliament. A Temple Mount Lobby is born. The tenth annual the Seekers of Zion conference was held in Israeli parliament on Monday, Haaretz reports. Israeli citizens and politicians gathered at the event to discuss and organize around altering al-Aqsa’s status quo. Participants also rallied around the creation of a new “Temple Mount Lobby” in the Israeli Knesset. The Temple Mount, revered as al-Aqsa by Muslims, is a compound above the Western Wall in Jerusalem that includes the Dome of the Rock and al-Aqsa Mosque. Since the 1967 occupation, an agreement with Jordan has maintained that Jewish prayer takes place at the Western Wall plaza – which was built on the site of a Palestinian neighborhood destroyed by Israel in 1967– but not in al-Aqsa compound itself. 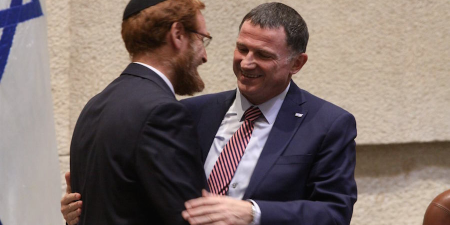 Settler, temple movement leader, and recently appointed Likud Member of Knesset (MK) Yehuda Glick organized the conference. Other Israeli politicians in attendance included Public Security Minister Gilad Erdan, Parliament speaker Yuli Edelstein, Agricultural Minister Uri Ariel, Deputy Minister of Defense Eli Ben-Dahan, Environmental Affairs Minister Ze’ev Elkin, Deputy Foreign Minister Tizipi Htovely, as well as MKs Amir Ohana, Anat Berko, and Shuli Mualem. “We have to call upon the government and Knesset to permit Jewish prayer, to make Jewish prayer something normal and permitted,” Ben-Dahan offered. Right-wing Israeli activists partook in the conference as well. In attendance included Temple Mount joint council head Yaakov Heimann, settler Rabbi Yisrael Ariel, and leader of “Return to the Mount” Rafael Morris. When we can say the Temple Mount is ours and only ours and there isn’t room there for anyone else, then we can be victorious in Amona, then we can conquer not only the Temple Mount but Jordan, and Syria, too, and establish a real Jewish state over all the land of Israel. Mainstream Judaism perceives the reconstruction of a Jewish temple on al-Aqsa compound as not as an immediate task, but one meant for eschatological times, after the coming of the messiah. Most orthodox rabbis maintain that access to the site is prohibited for Jews until then. But, there is a growing movement of Israelis that openly work to upend al-Aqsa’s status quo and force it open to Jewish prayer. Some even do so with the goal of building a Jewish temple there. Organizing Jewish tours with the intention of exceeding the “sightseeing” activities the status quo asks non-Muslims to adhere to is a key part of their effort. During the tours, participants attempt to utter Jewish prayers or walk barefoot at the site, at the same time as their armed Israeli police escorts exact violence and movement restrictions directed on Muslims and Palestinians. Palestinians as well as the Jordanian Waqf that oversees the site say that though al-Aqsa’s status quo may appear contained to the rest of the world, Israeli police and settler conduct at have already changed it. More news at the Alternative Information Center (AIC).